One of the lesser known optical Brands is KAHLES, yet this small Austrian company is proud to be the world's oldest riflescope manufacturer and a real pioneer in this field. Kahles began life in 1898 when Karl Robert Kahles merged the Simon Plossl Company and the Opto-Mechanical Workshop of Karl Fritsch in Vienna to found the KAHLES Company. By 1900 Kahles introduced the legendary Telorar riflescope which was highly respected by hunters at the time also around the same time, KAHLES binoculars were first produced as well as astro telescopes. 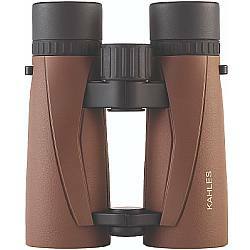 Kahles no longer produce telescopes, but they do still make a small selection of high end binoculars, rifle scopes and accessories. A fact that Kahles Optics can be proud of is that they are one of a select group of premium optical brands that still creates most of their products inhouse in Austria. This is in stark contrast to the many brands that now outsource most production to factories in countries where labour is cheaper. 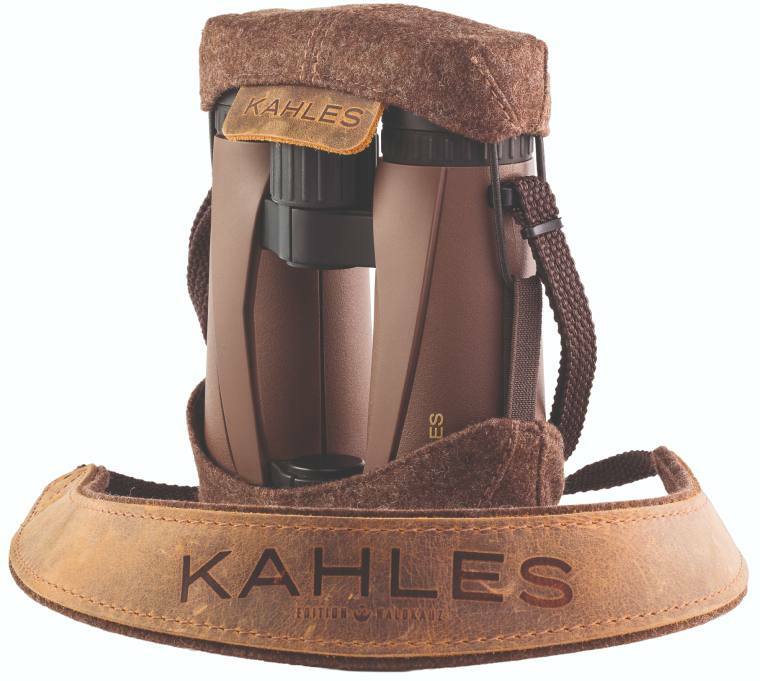 Whilst KAHLES binoculars are designed with hunting in mind, their attributes also mean that they make excellent birding, safari and general use binoculars and I would urge anyone interested in a high end European optic, that is a little different from the norm to consider these. I have been asked why the Kahles binocular range is so small. This is because their only focus is on the high end market and so do not offer any models with anything other than their best components. Currently they only have a couple of 8x42 and a 10x42 models and have just released a series of laser rangefinder binoculars. All of which are produced from the highest grade materials to the industries tightest tolerances. Designed and I believe made in Austria, although I have heard some rumors that some parts are made in Japan. Either way, the Helia series from Kahles is their latest offering and currently consists of three high quality roof prism models. As I mentioned, there are currently three models, an 8x42 and 10x42 and a Helia 8x56. All use BaK4 Schmidt-Pechan roof prisms. 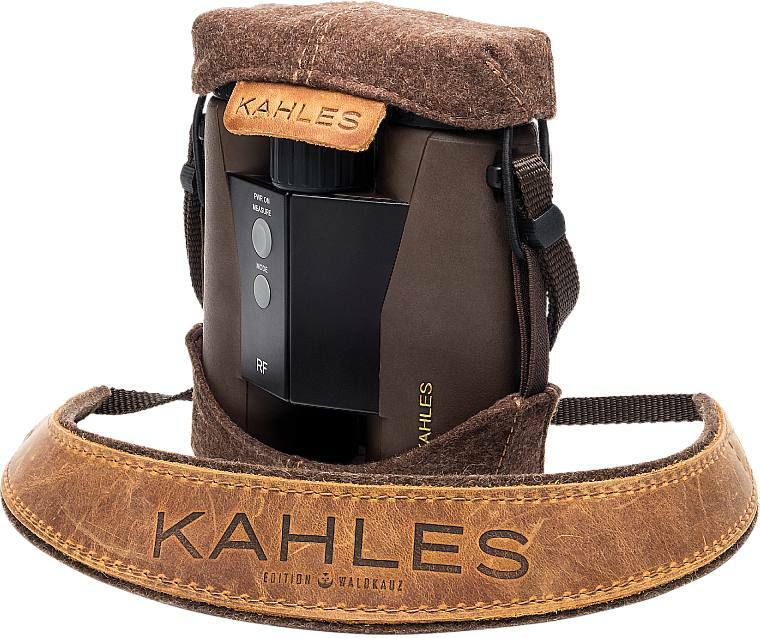 Kahles Helia binoculars feature an open bridge body design with a fully sealed chassis that is filled with nitrogen gas to prevent internal lens fogging. The exterior rubber coating comes in a rather unique brown color, that certainly stands out from the crowd, but at the same time is perfectly camouflaged, which is important for hunting. Their twist-up eyecups have 4 click-stop settings to make attaining the perfect eye-relief for your face shape easier, with or without glasses. Exterior lens surfaces feature an "oil-phobic" layer of coatings that ensure the lenses remain cleaner for longer and require less pressure to be applied when cleaning, thus helping to ensure you do not mark them in anyway. One of the standout features of the Helia series is their collaboration with the renowned Waldkauz® company in making the neckstrap and fairly unique protective cover. Hand made from leather, felt and natural wools, these not only look great, but are durable and are "noiseless" according to Kahles. This is especially true when you compare them to cases that have Velcro or Zip enclosures that can make quite a lot of noise when opening. Once again for the hunter, wildlife observer and some birders this is an important feature. As you would expect from a premium brand, their high end offering is not cheap, but if you are looking for an "alpha" type binocular that is something a little different from what most others will have then these will most certainly fit the bill. Firstly, as a company that is world famous for their rifle scopes and which focuses much of their attention towards hunting, it is somewhat surprising to me that they have taken so long not only to release a rangefinding binocular, but a laser rangefinder. Whilst still of a high quality the Kahles Helia RF binoculars do not use the same optics as the standard Helia range. This can be seen by the specifications (see table below). I have also been reliably informed that like so many other rangefinding binoculars, these are manufactured in China, which for a company like Kahles is a big change, but I suppose to remain competitive within the market they have had to outsource the expertise in electronics. The Helia RF is available in either an 8x42 or 10x42 configuration. The laser rangefinder used within these instruments has an impressive maximum range of 1500 meters, which is further than that of many of their direct competitors. The heads-up display can be altered in brightness without having to go through the menu. This is a small but important detail as it ensures you can quickly get all the information clearly displayed no matter the ambient light conditions. So for instance if you walk out from a dark forested area into bright sunshine. The ranger has a scan mode that constantly updates the distance display as you pan about, which is ideal for moving targets. There is also a ballistic mode which takes the angle and distance to the target into account. Like the non RF versions, these feature twist-up eyecups with 4 click-stops, however you do get slightly less eye-relief. However there should still be enough should you wear glasses. 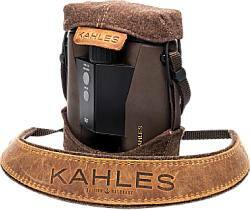 I also think an impressive feature of the Kahles Helia RF binoculars is their relative low weight and compact size. These really are not far different from a standard pair of bins. It is also great to see that these come with the same beautifully hand-made neckstrap and protective covers that which you get with the standard Helia series. 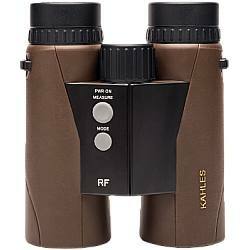 Kahles produce two full sized 42mm roof-prism binoculars, one with an 8x and the other a 10x magnification. 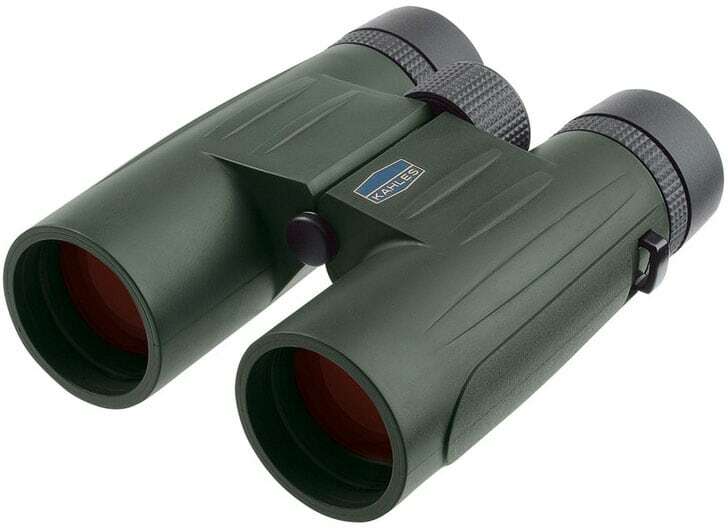 Designed specifically with hunting in mind, their tough, lightweight body with high end optics also make them ideal as bird watching, general use and full sized safari binoculars. 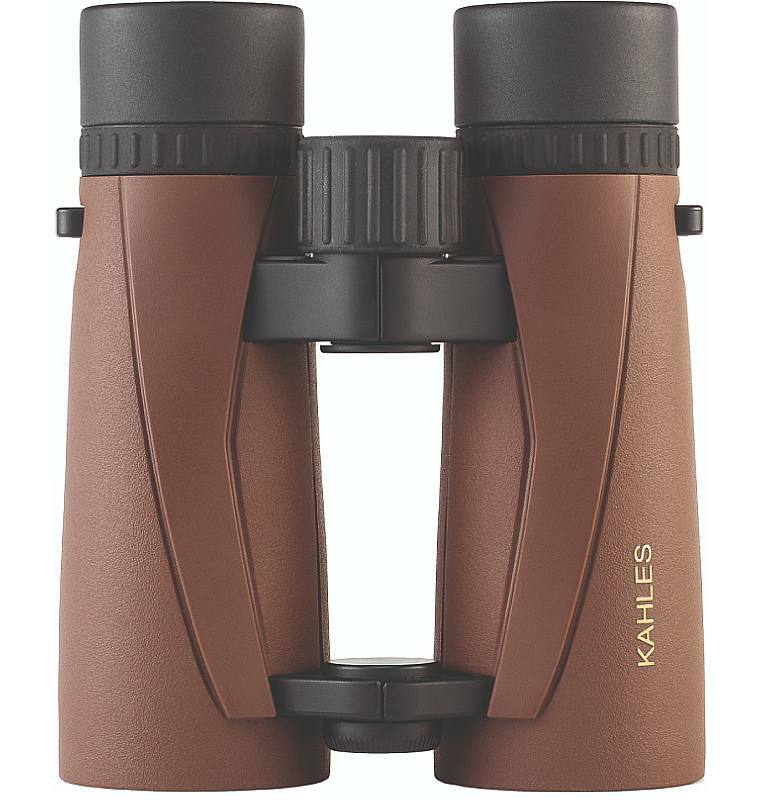 All KAHLES binoculars are made from the highest grade materials to the optics industries tightest tolerances and feature shock and noise dampening armor made from natural rubber materials and colored in Austrian Loden green. The side palm swells and non-slip grooves provide a sure grip under any conditions and both Kahles binoculars are fully waterproof and submersible. The shell of the body is constructed from a magnesium alloy that is both light as well as strong. 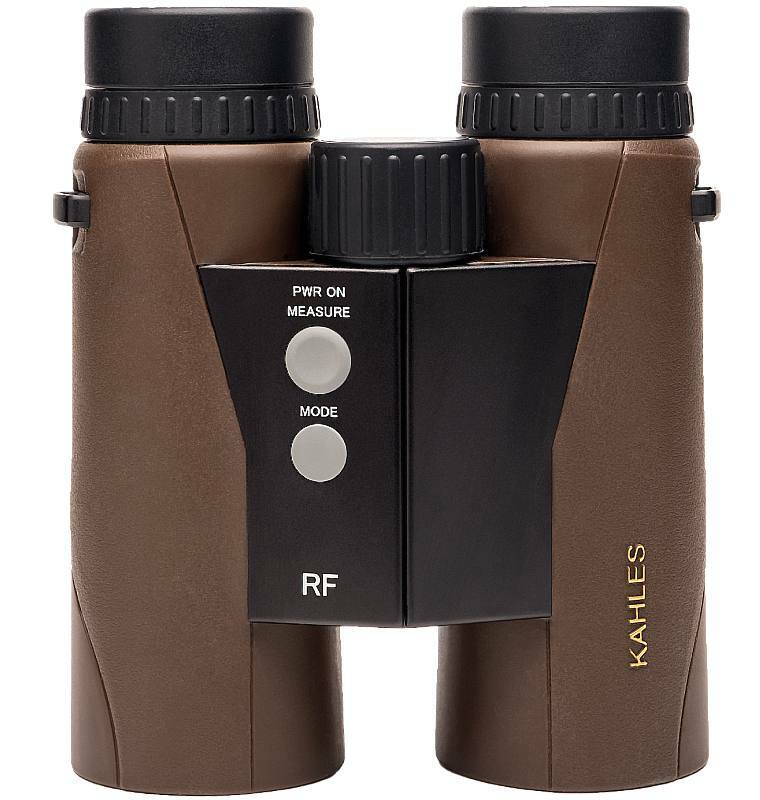 These Kahles hunting binoculars also have Phase correction coatings on the quality Bak-4 prisms and what they call their AMV anti-reflection coatings to help maximise light transmission between 500 and 540 nanometers for superior low light performance. Depending on the model, these top of the range binoculars cost between £500 and £800 or $500 and $800 in the US.